I have a huge sweet tooth and cake pretty much always makes me happy. I've started making more cakes from scratch these days, venturing into new recipes and I'm really enjoying the difference I taste between a boxed mix and a cake I make from scratch. Don't get me wrong, I still reach for a mix when I'm in a time crunch, but when I have the time to plan for a special dessert I love taking the time to bake one from scratch. Watch out, this one is addicting! I love lemon and strawberries AND fresh mint and this recipe combines all three perfectly. The texture of the cake is amazing alone, but let it sit overnight and soak in all that lemon glaze and be astounded by your creation. It's like the perfect blend of pound and sponge cake with a fantastic lemon flavor. The simple syrup infused with mint (I used spearmint leaves rather than a stronger peppermint) adds just the right touch of flavor and freshness without being overwhelming. Basically, this is the perfect summery cake to give a try! Preheat the oven to 350 and coat an 8" round cake pan with nonstick spray. Line the bottom with a round of parchment paper and spray the parchment. Flour the pan and tap out the excess. Sift together the flour, baking powder and salt in a bowl and set aside. In the bowl of a stand mixer, cream together the sugar and butter until light and fluffy (3-5 minutes). Beat in the eggs one at a time, then add in the lemon juice, lemon extract and lemon zest until well combined. At a low speed, start to add in the dry ingredients in thirds, alternating with the whole milk. Begin and end with the dry ingredients. Don't overmix or the cake will be tough! Spread out evenly in the pan, tapping a few times against the counter to make sure the batter is evenly distributed. Bake 30-35 minutes until a toothpick inserted in the center comes out clean. Cool on a wire rack for 15 minutes. While the cake cools, make the glaze. Whisk the powdered sugar and lemon juice together in a small bowl until completely combined and smooth. Add additional lemon juice if needed to get the consistency you want. Carefully remove the cake from the pan and place on a plate or platter. Pour the glaze all over the cake, allow it to drip down the sides and puddle around the cake. If you have time, make this one day ahead of serving and allow it to sit (covered) overnight and soak up all that glaze! To make the syrup, whisk together the sugar and water in a small saucepan. Bring to boil and stir until the sugar is completely dissolved. Allow to remain at a simmer and add in the mint leaves. Stir occasionally and let them steep for 12-15 minutes before straining into a bowl and allowing to cool. Once the syrup has cooled, pour it over the strawberries. Cover and refrigerate if making the night before, otherwise serve at room temperature. Make the cream right before serving by pouring the powdered sugar, heavy cream and vanilla in the bowl of a stand mixer and whipping on high speed until it holds soft points. 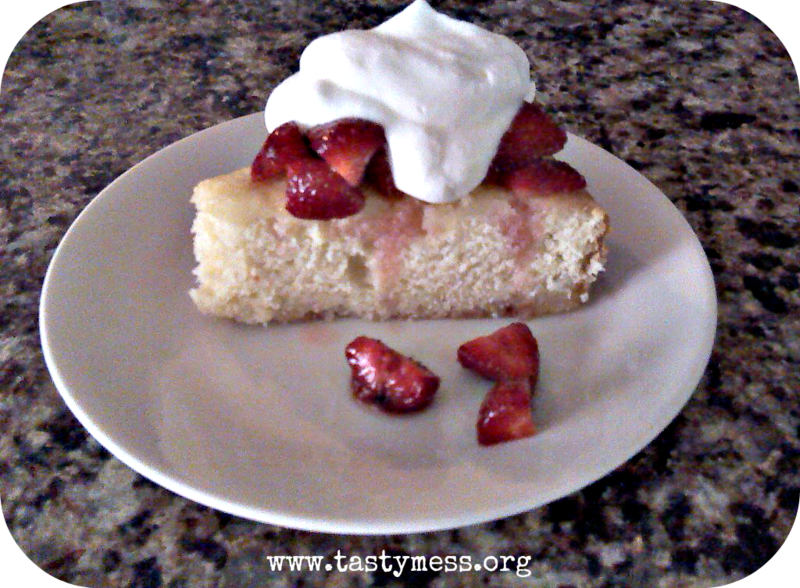 Serve the cake sliced and topped with the strawberry syrup and fresh whipped cream. Yum! I'm going to have to try this!